I actually debated writing this review for the novel MAKING NICE by Matt Sumell. I read this book quite awhile ago and never got around to reviewing it. I remember enjoying this book and being rather impressed with the author, but I fully admit that I don't recall a lot of specifics about the stories. It's probably a disservice to write a review at this point in time, but I'll give it a shot. MAKING NICE tells the story of Alby, a man (not a very mature one by any means) who is just angry at pretty much everything in his life. I guess you could say he has some anger issues. Alby is just trying to get through life after his mother's death. The book follows Alby as he attempts to "make nice" with his family, strangers, and even himself. MAKING NICE is both hilarious and tragic, but most of all, it's very entertaining! I was very impressed with MAKING NICE. It received starred reviews from Publishers Weekly and Booklist, and Entertainment Weekly even raved about it! MAKING NICE is the debut novel by Matt Sumell, and I definitely think he's going to be an author to be reckoned with. He created a memorable character in Alby and his prose was both smart and eloquent. While MAKING NICE was a novel of Alby's life after his mother's death, it was presented in a unique format. The novel was actually a collection of stories, each chapter was almost like a separate short story, that together made up Alby's life. Some of the stories were a little odd, while others were extremely funny. Overall, they were a pretty profound statement on loss and sadness... and anger. Alby truly in a one-of-a-kind character. I don't think I've ever encountered someone quite like him in all of my reading. On one hand, he's horrible. He punches his sister, drinks too much, fights with strangers, and insults just about everyone he meets. However, on the other hand, he does exhibit signs of tenderness and compassion -- just when you begin to think he's incorrigible. Needless to say, he's a fascinating character given his behavior and his insights. 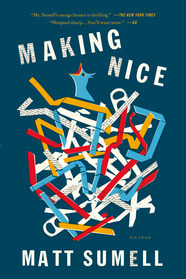 MAKING NICE is an entertaining collection of stories that will make you laugh and think. I promise you Alby is one of those characters that you won't be able to forget. Highly recommended! I'm sure there are a lot of people who've found themselves in Alby's situation. This sounds great!